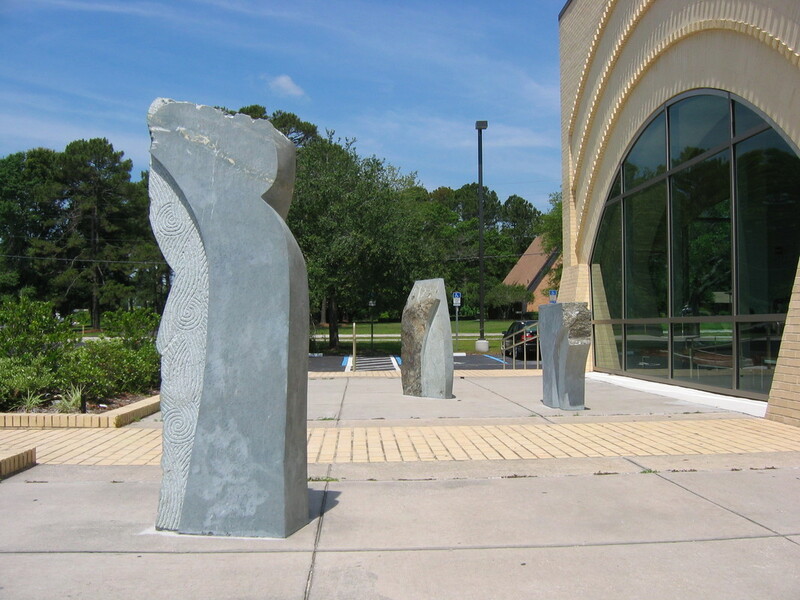 In 1997, the City of Jacksonville increased their investment in the arts by allotting a percent-for-art in eligible city construction projects in an effort to add to the City’s public art collection. The ordinance designated an Art in Public Places Program (APP), which would be administered on behalf of the City by the Cultural Council of Greater Jacksonville. 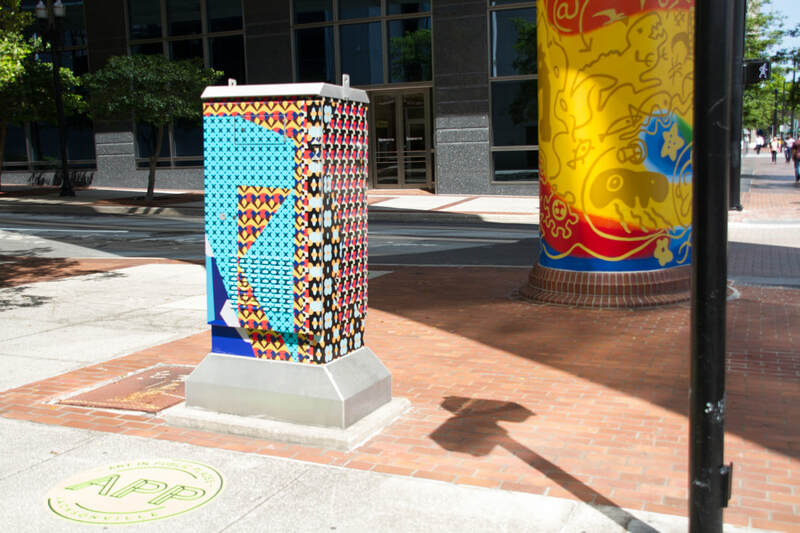 Together with the APP Committee and support from the Mayor, City Council and City Departments, Art in Public Places has acquired over 115 public artworks and memorials throughout Duval County. APP, through the Cultural Council of Greater Jacksonville, oversees the selection, installation, maintenance, and conservation of the artworks. This program was designed to integrate a wide range of art into spaces that are free and accessible to the public. The City ordinance requires that a percentage of the collection be representative of the artists from Northeast Florida. The artworks contribute positively to Duval County’s evolving and vibrant urban landscapes. Through its collection and related programming, APP raises public awareness, knowledge, and appreciation of the arts through direct experiences. Extensive advocacy efforts led to the City of Jacksonville establishing the Art in Public Places Program (APP) ordinance (Sec. 126.901). The Better Jacksonville Plan outlines funding sources for APP. The Cultural Council of Greater Jacksonville is appointed by the City of Jacksonville to administer APP. The APP Internship Program is established with the objective of providing college students with hands-on training in arts administration and experience working in the non-profit sector and engaging with City government. APP introduces the first City approved 5-year plan, which covered policies and procedures from 2012 through 2016. The first conservators report was completed, which established a schedule for maintenance and conservation. ​APP joined the WESTAF's national public art archive. The APP ordinance is modified to include additional surfaces appropriate for public art and the creation of Urban Art Facade and Streetscape Program (DIA). Ordinance changes were introduced by Council Member Gulliford and co-sponsored by Council Member Bishop. Jacksonville hosts the Florida Association of Public Art Professionals (FAPAP) state conference. The Cultural Council successfully advocates for more than $100,000 in past due APP funds, which were due since 2006 for public art, administration, and maintenance. The bill was introduced by Council Member Cresciembeni and co-sponsored by Council Member Hazouri. APP develops new City approved 5-year lan, which introduced program goals and objectives. 23 pieces of City owned art were appraised as the first step to introducing those works into the APP collection. The Cultural Council launches an interactive map of Jacksonville's public art. DIA Urban Arts Project, Phase One is completed. 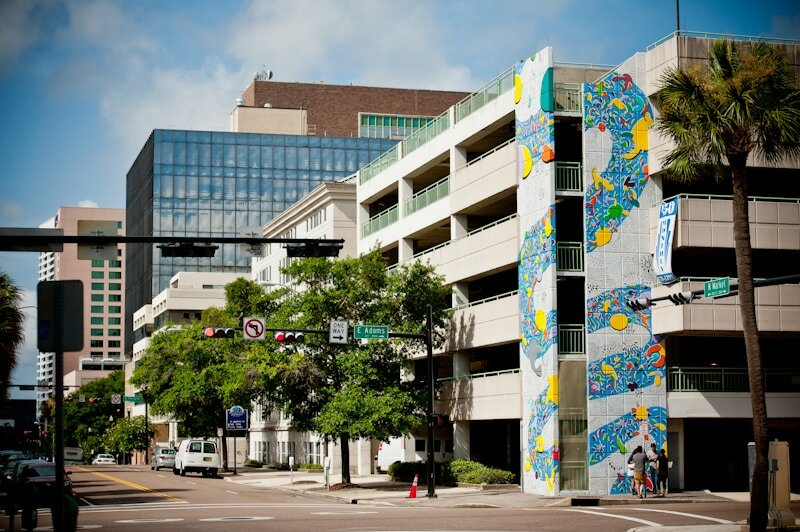 A total of 38 pieces were added to downtown Jacksonville's visual landscape. Since 2010, the Art in Public Places Internship Program has played an important role in advancing student and volunteer exposure to careers in art administration within the non-profit and public services sectors. Interns gain on-the-job experience in the daily operations of the Cultural Council of Greater Jacksonville through the administration of the City of Jacksonville's Art in Public Places Program. Average 10-15 hours per week or by college semester. Qualified students and volunteers will learn from all aspects of the Art in Public Places Program (APP). The APP Program’s infrastructure consists of three facets that are essential in order to function successfully. These three facets are Administration, Public Art, and Collections Management. Interns will have the opportunity to engage each facet throughout the duration of their internships. Through a combination of hands-on, individual, and collaborative projects, interns become integral members of the Art in Public Places Program team. APP Program expectations include participation in daily activities, contributing ideas, and producing excellent work, all while earning college credit or serving as a volunteer. Candidates should be proficient in Microsoft Office Suite. Graphic design experience is a plus. Public Art Administration: Administrative learning experiences involve APP Committee meetings, website and social media, and special projects and events. Public Art Project Management: Projects are ongoing and often span one to three years (or more)--interns will experience at least one part of the process which may include artist submissions, Art Selection Panels, community engagement, and the public art design and installation process. Public Art Collections Management: Collections Management is vital to the sustainability and integrity of the APP Permanent Collection. Collections Management may consist of but is not limited to experience with curatorial research, cataloging ,maintenance and materials, and archives. Candidates will be selected based upon their skills and qualifications. Qualified candidates will be interviewed by the Director of Art in Public Places. Interested candidates should complete the APP Internship Application by clicking the button below. ​The City's official collection currently consists of 115 pieces of art, including works from local, regional, and national artists. The collection includes photography, murals, mosaics, sculptures, and street furnishings. ​The goal of APP is to exhibit visual art that is compatible with and will enhance the architecture and general environment of the City. The Artist creates this allegory through architectural references, portraits of famous Jacksonville personalities and writers, and illustrations of literary works by Jacksonville authors. The city’s beginnings as Cowford, as well as the contemporary skyline are part of this visual exploration of Jacksonville's culture and history. Working with local historians and community leaders, Kathryn Freeman used local architecture as the framework for the murals. In response to her invitation, over 1000 school students wrote the artist regarding their favorite books, characters, and the authors which the artist incorporated into the work. 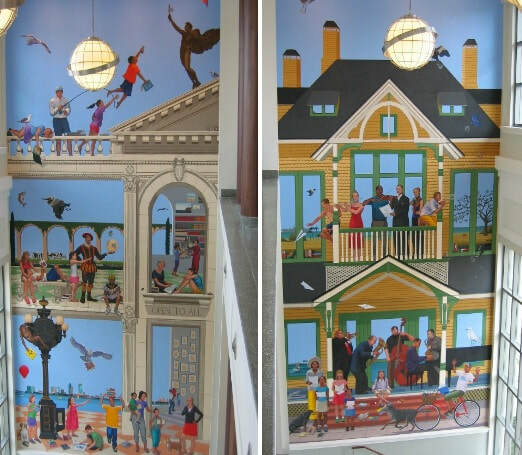 The murals include authors with ties to Jacksonville, characters from children’s classics, historic civic leaders, and favorite local pastimes. 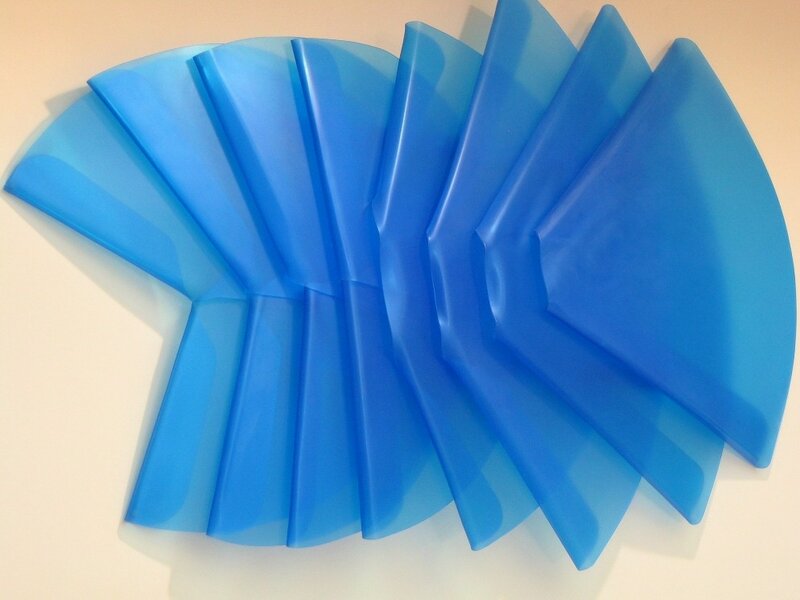 Eight icy blue panels of layered heat-formed acrylic sheets suggest forces of nature such as breaking waves, the artist states, “The interpretations of the viewer complete the work by the act of visual engagement. I welcome all possible interpretations.” The artist guides the viewer with the title; the word “aqua” comes from the Latin word for water. Phillip Estlund is a 1992 graduate of Douglas Anderson School of the Arts in Jacksonville and grew up in Old Arlington. 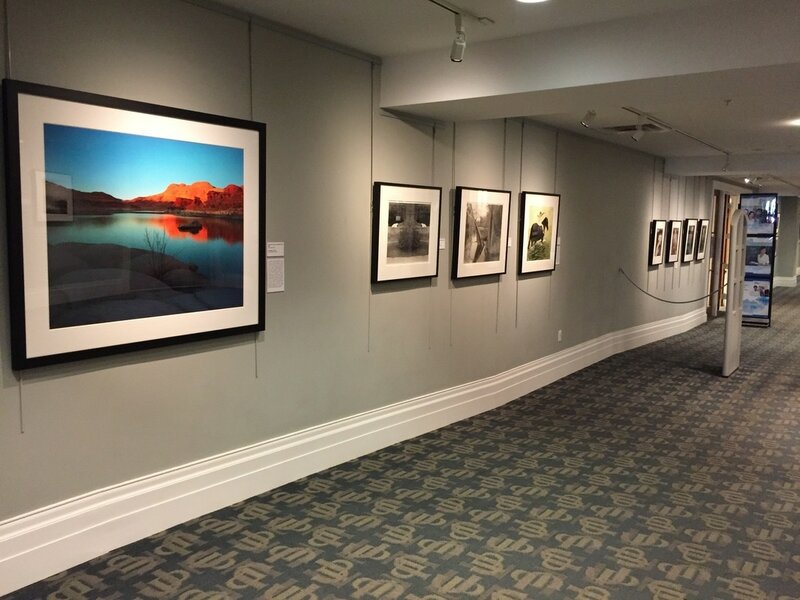 The works of 15 notable photographers’ comprise the city of Jacksonville’s Art in Public Places Photography collection. 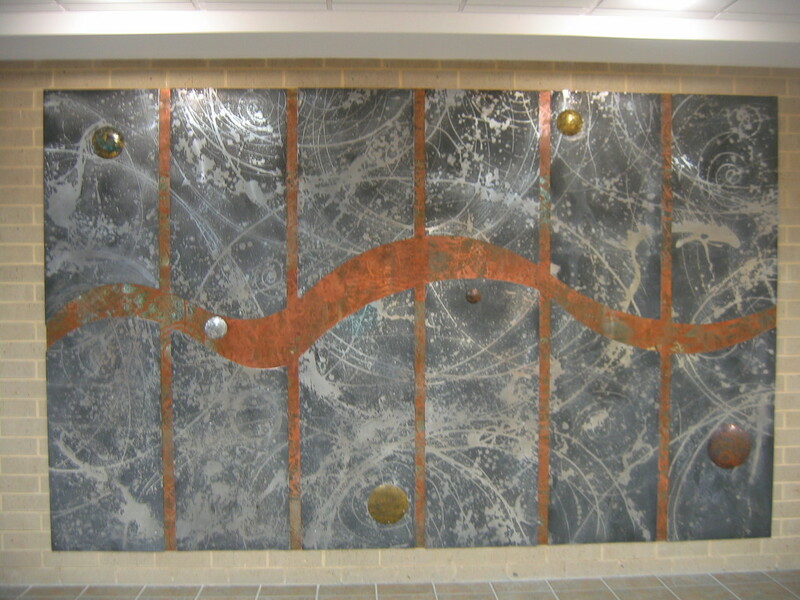 Thirty-six works are currently displayed in the lower level gallery of the Main Library including artist and artwork information. An interactive kiosk located in the gallery also features highlights of community engagement as part of recent Jacksonville Public art projects. The following artists are represented. Linda Broadfoot, Tom Chambers, Frank Dienst, Susan Kae Grant, Judy Habert, Tom Hager, Paul Karabinis, Thersa Segal, Jay Shoots, Amy Stein, Maggie Taylor, Anna Tomczak, Jerry Uelsmann, Rick Wagner, and Mark Sain Wilson. Homage made in bronze, this life-size statue of Florida’s longest serving congressman stands erect in Hemming Plaza and faces in the direction of Washington. Mr. Bennett had few requests for his depiction, one of them being the inclusion of the U.S motto “In God We Trust” a quote found on all U.S currency and an act of legislation Bennett helped sponsor. In Circ de Vie, Sarah Crooks Flaire explores the natural world by combining figurative drawings with botanical imagery completing a bountiful circle of life. This monumental puzzle painting incorporates three-dimensional cutouts of the five elements (water, fire, earth, wind and space) and is a visual celebration of the diversity of living things. “Coruscating river,” by St. Augustine artist Felici Asteinza and Joey Fillastre of Milagros Art Collection, is best seen by drivers entering downtown from the Hart Bridge Expressway, a main thoroughfare carrying over 50,000 motorists each day. This mural depicts the qualities of line, shape and color to radiate human dignity and the vibrancy of life. 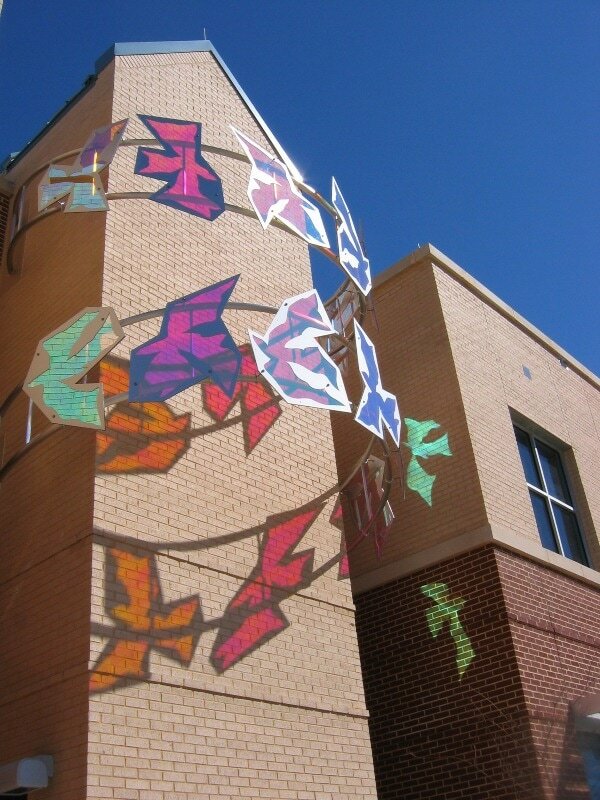 David Griggs’ birds appear to fly around the exterior tower and encircle the rotunda, casting colored shadows and creating a sense of dynamic movement. The design was intended to engage children, parents, neighbors, staff, and visitors with a playful and welcoming presence. 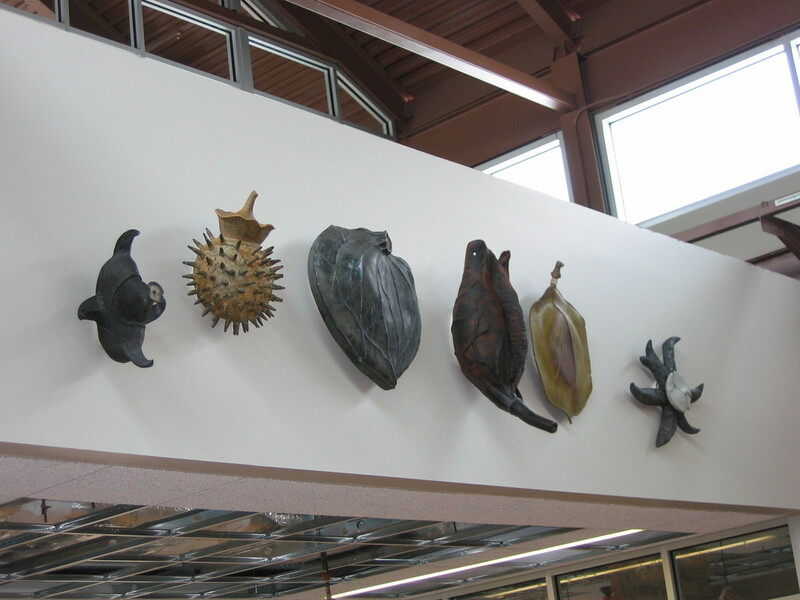 Griggs’ interest in creating a sense of movement with stationary sculpture can be seen in other works, such as a suspended atrium sculpture at a fitness center in Santa Fe, New Mexico. Paul Braun explains, “Sculpture is about creating form in which the artist demonstrates control, balance, and mystery.” The carved abstract symbols and organic patterns inspired by Celtic carvings and ancient stone formations, such as Stonehenge. Soapstone has been used for carving for thousands of years by artisans throughout the world. Braun intentionally left the stone rough in some places to reveal the natural beauty of the material. “Girl with Origami” is a symbolic creation from Neptune Beach artist Sean Mahan, meant to express the harmonious interaction between an individual and her surroundings. Mahan’s mural is designed to engage pedestrians at the street level and serve as a visual connector to accessible public parking. 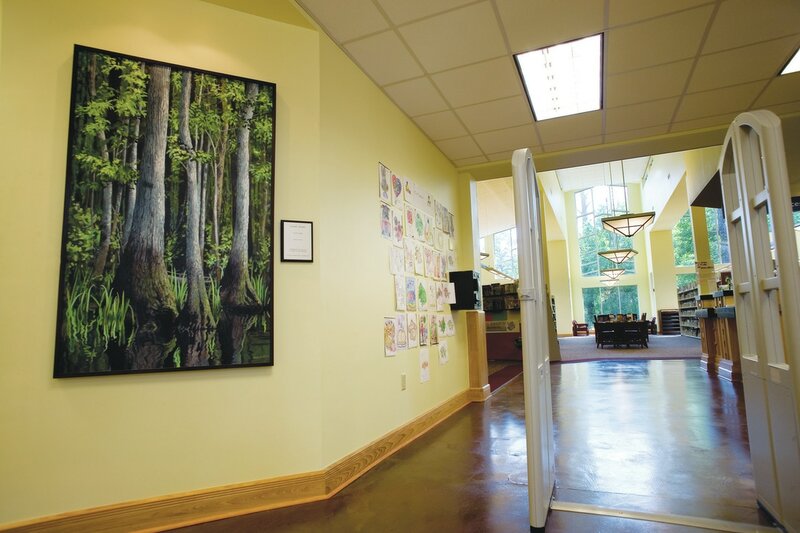 Allison Watson, a lifelong resident of North Florida, is renowned for large-scale landscape scenes in Florida and the South. Watson paints from her own photographs of local sites as well as remote locations around the world. Haven Creek depicts woodlands found in Western Duval County. “All of the wonderful things that we can find in the world of imagination can be found between the pages of a book,” Kelli Bickman writes. This whimsical and colorful mural depicts children engaged in reading to illustrate the power of books, the magic of libraries, and the importance of imagination. Bickman is not only a painter but has published her own book of photographs (What I Thought I Saw) in addition to illustrating and designing book jackets for several notable authors. Susan Cooper's three-part installation was inspired by the rich history of art, music, and film at the theatre. She uses light and color as her predominate artistic media. Eight aluminum wall-mounted sculptures depict abstractions of film, music, art, and water. A sculpture made from woven, colored LED light tubes wraps around the southwest corner of the building, while an installation of crisscrossed lights projects onto the top level of the building - viewable from a considerable distance. Cooper was inspired by MaVynee Betsch, better known as the Beach Lady, who worked for over 30 years to preserve American Beach, one of the few beaches open to African-Americans from the 1930's-1960's. Like Betsch's complex hairstyle, Cooper braids metal, color, and light to reflect the Beach Lady's intertwining of history and culture. This large-scale glass sculpture is suspended from the ceiling of the Times-Union Center for the Performing Arts. The spiral form is reminiscent of a corkscrew, twists of a rollercoaster, or rolling waves of water. Funded by Brumos Motor Cars, Inc. and presented as a gift to the City of Jacksonville, the work was created by Jacksonville University faculty and students. It weighs approximately 4,000 pounds and consists of more than 300 individual glass horns. David Olson describes the work as, “abstract gestural starfield with constellations and a copper river undulating through the center.” The title of this work, Meander, refers to the windings of a river or the act of wandering. Like the title suggests, library is a place to wander and discover, a place where facts and imagination meet. This memorial commemorates the Great Fire of Jacksonville in 1901, the largest metropolitan fire to have occurred in the South, before or since. Reportedly the fire started at a mattress factory in the LaVilla area, quickly destroying over 2,000 buildings, leaving 10,000 people homeless. Despite the devastation, the fire triggered an amazing reconstruction effort that established the foundation of modern Jacksonville. Bruce White describes this memorial as a form "rising from the ashes." His Memorial to the Great Fire of Jacksonville was the first work created after the City of Jacksonville adopted the Art in Public Places Ordinance. 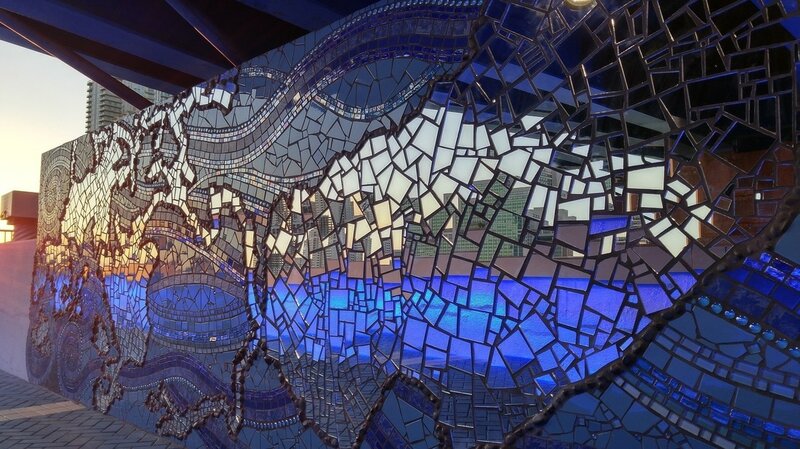 “Mirrored River: Where Do You See Yourself?” by Kate and Kenny Rouh of RouxArt is a mirror mosaic of the St. Johns River, surrounded by an organic and flowing wavy pattern of blue tile and mirror, and five quotes about the rivers significantly hidden throughout. The curved blue forms mimic the St. Johns River, while the geometric shapes reflect the city. The pattern represents the movement in both realms and is used to visually mend the two. Roxanne Hovarth and Peter Rumpel are local artists/architects. No Couch Potatoes Here is a group of three oversized chairs designed to attract visitors to the outdoor amphitheater and to encourage interaction with the work. 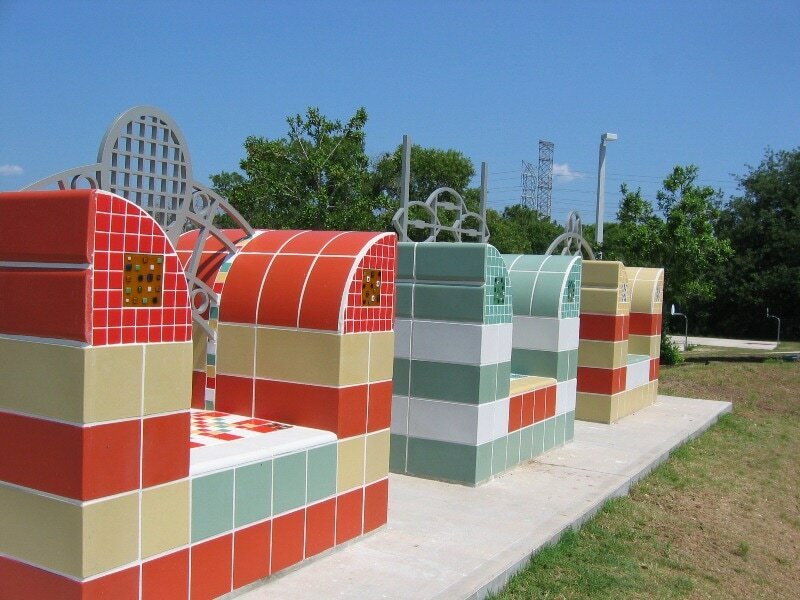 The backrests of each chair/throne feature abstract shapes related to football, basketball, and tennis - all of which are after-school activities at the PAL. Horvath and Rumpel also designed the Richard and Annette Bloch Cancer Survivors Park on State Street in downtown Jacksonville. Michael Stutz's signature technique weaves and welds bronze to capture this graceful horse in motion. His work investigates the history, physical characteristics, and daily activity at the site of each of his works. In the case of Pine Breeze Dandy, the subject reflects the purpose of the facility while the title was inspired by the pine trees surrounding the wooded site. Stutz stated, "My role as an artist involves a great deal of communicating, educating, and listening." Segal was confronted with a difficult task - to create a piece that would serve as both an artwork and as identification for the building. He chose to create one vertical sculpture while another horizontal sculpture doubles as a sign for the library and community center. Both illustrate Segal's trademark minimalism and hand-worked surfaces. In this work and others, the artist strips away the surface of the material to reveal what lies beneath, much like the erosive processes in nature. Both pieces intentionally complement the exterior of the library. “I create works of art designed to give meaning and to identity public spaces," Barbara Grygutis writes. Her sculpture depicts a baseball player in classic uniform, framed by the outline of a baseball trading card. Here Grygutis celebrates both the great American pastime and the shared nostalgia of collecting baseball cards. Her installation is complemented by granite benches shaped like baseballs- creating a gathering place for people to meet at a game. In 1918, the Rotary Club of Jacksonville was instrumental in organizing a community-wide effort to create Memorial Park to honor the 1200 Floridians who died in World War I. The year 2012 marks the 100th anniversary of the founding of the Rotary Club of Jacksonville Florida's first club. This monument recognizes Rotary's contribution and commitment to service above self. Artist Brower Hatcher was inspired by the tree imagery Rev. Barnum McCarthy used in Fowler’s eulogy – “She may have been known as a Steel Magnolia, but to me she was a mighty oak. She reached out in all directions, gracing everything she touched. She always made a difference.” Fowler served as Jacksonville’s first female City Council President from 1982-1985 and later served four terms in the U.S. House of Representatives. When she retired in 2000, Fowler was the highest ranking woman in the U.S. Congress and received the Navy’s Distinguished Public Service Award and the Department of Defense Medal for Distinguished Public Service. Fowler joined the Washington D.C. office of Holland & Knight in 2001, and died in March 2005. SquirrelyQ is suspended across the glass facade of the building in five vertical columns. The fused glass, or glass that has been fired in a kiln at a range of high temperatures from 1,100°F to 1,500°F, is brightly colored and interestingly textured. The use of dichroic glass introduces an iridescent surface that creates a luminous effect in natural and artificial light. Additionally, Liz Mapelli was commissioned to create Deepest Secrets, a mosaic of glass tiles, for Baptist Hospital South in Jacksonville, Florida in 2005. Stepping Stones is a series of trompe l’oeil or “fool the eye” paintings depicting irregular groupings of stones painted directly on the floor tiles. Nofa Dixon is known for painterly surfaces on three-dimensional clay forms. The artist also uses two-dimensional formats with "the intent of pushing the clay medium to new levels of form and embellishment." BJ Katz is a leader in the kiln-fired art glass industry. Inspired by the rich quality of sunlight in Florida, the artist created a work of art based on sunshine. Sun Salutations hangs under the glass ceiling of the library and is illuminated by natural light during the daytime. 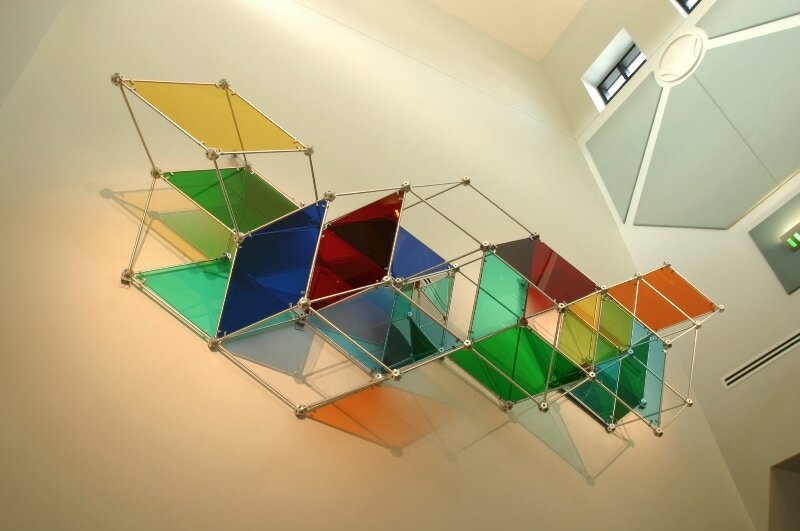 Light quality, viewer perspective, and light refraction make this piece appear to change; on a sunny day the piece looks different than on a cloudy day. Six kneeling figures greet visitors as they gather for events. The figures symbolize the six inhabited continents of the world and silently communicate through the universal language of color. Lights inside the kneelers are programmed to change colors regularly, as if the figures are speaking to one another. 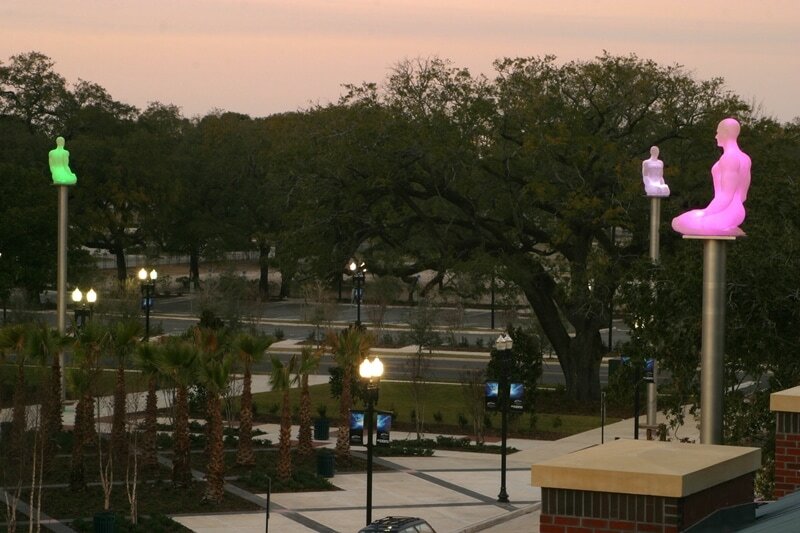 By placing the figures atop 30' high poles, the artist forces the viewer to gaze upward towards, what he called, "the beautiful Jacksonville sky." 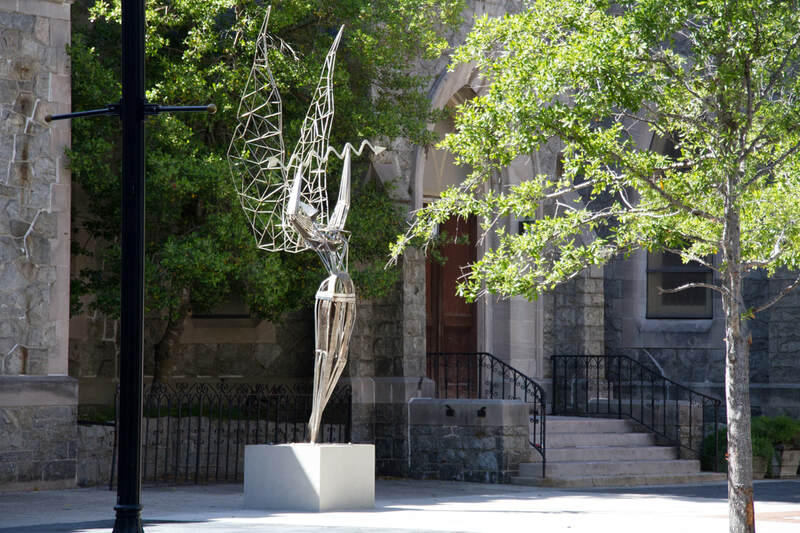 The kneeling figures, in proximity to a nearby restored historic church, also evoke a connection between the heavens and the earth. Al Held is well-known for his large-scale paintings of abstract geometric forms. Like many painters in the 1950s-1960s, Held reacted against the spontaneity and disorder of gestural Abstract Expressionist painters such as Jackson Pollock. 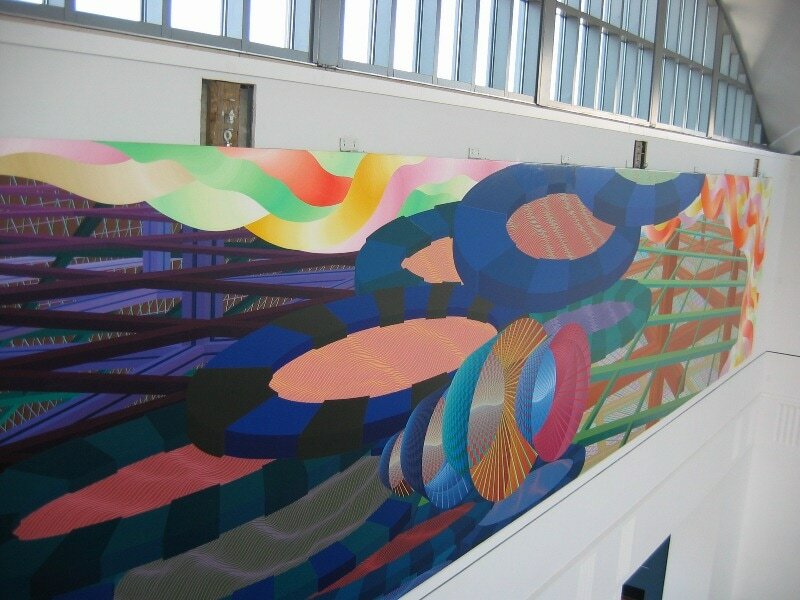 The artist was originally commissioned to create four paintings for the Library's Grand Reading Room, but only one was completed before his death in July 2005. 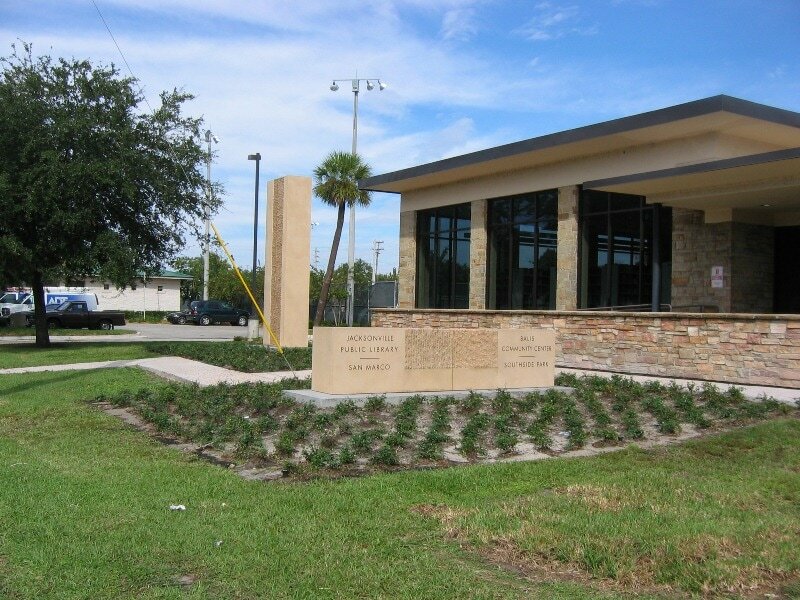 The artwork was funded by a gift from the Jacksonville Public Library Foundation. Untitled Quasicrystal Sculpture suggests the structure of a gigantic, 300 pound molecule. In fact, Quasicrystal refers to a relatively new branch of crystallography, which is the study of atomic and molecular structure. Tony Robbin explains, "My work uses a new geometry taken from science and mathematics to create structures with new visual properties appearing to change shape as one passes by on foot." Much like a kaleidoscope, as you move closer to or father away from the work, its configuration seems to magically transform. To date, Untitled Quasicrystal Sculpture is Robbin's only public art on view in the world. Larry Kirkland uses the owl, a traditional symbol of wisdom, to identify the Main Library as a place of information and learning. In ancient Greek mythology, Athena, Goddess of Wisdom, was the daughter of Zeus. She was able to change form, often into an owl. This work was inspired by a sculpture created by Michelangelo for the Medici Chapel in Florence, Italy. 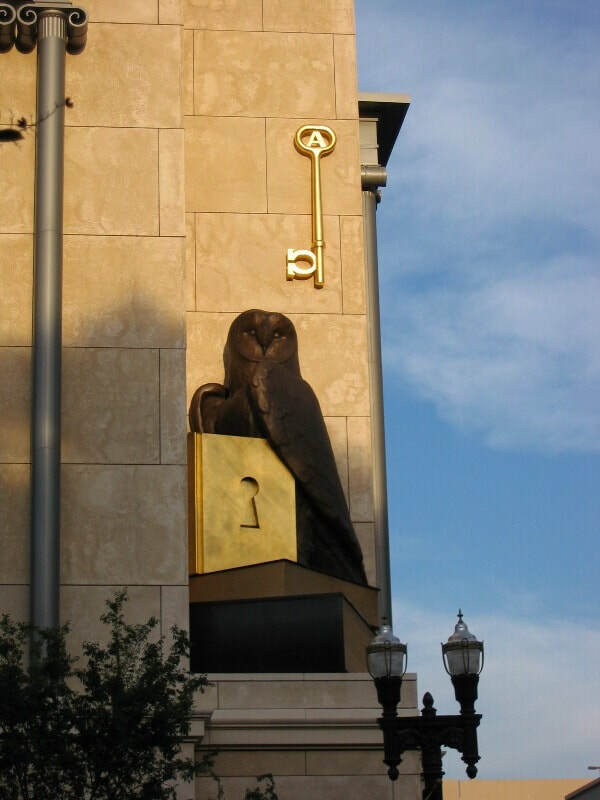 The golden key behind the owl incorporates the Greek letters for A and Z, referencing the beginning and the end, while the book itself unlocks the knowledge inside books. 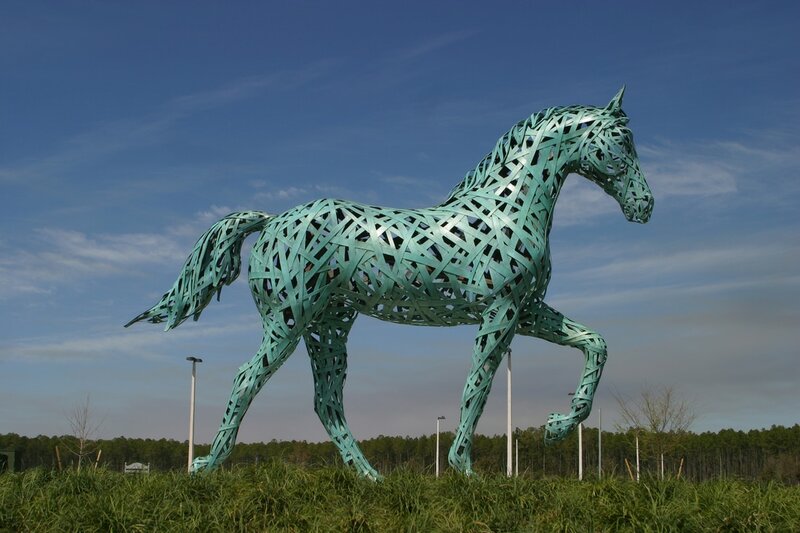 In 1999, Kirkland also created an installation of cast bronze animals, toys, and trains in the Kid's Walk, a 650-foot bridge connecting Jacksonville's Wolfson Children's Hospital and Nemours Children's Clinic. 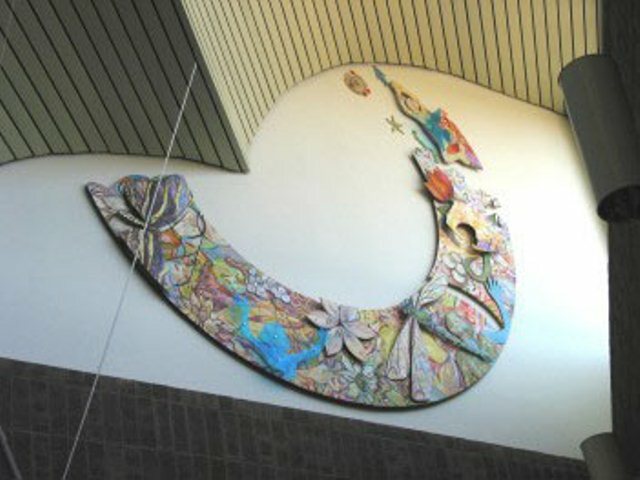 The artists describe the entrance as, “a gateway to a safe haven for learning and friendship.” Nearly 100 children worked with two artists to design and install the mosaic entryway. 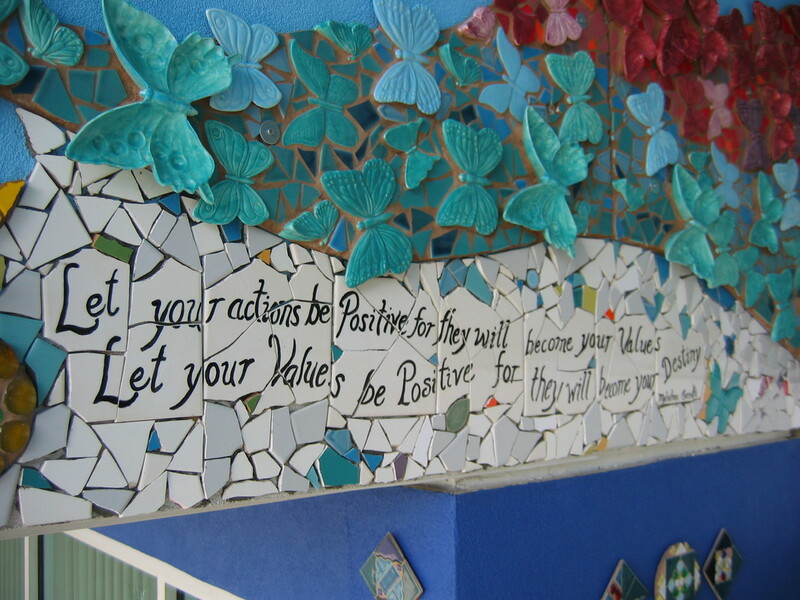 Quotes from world leaders such as Gandhi and Martin Luther King, Jr. intermingle with whimsical imagery of spirals, butterflies, and harlequin shapes to inspire the children each time they enter the building. The Sculpture is a feminine figure with wings. The woman represents maternity; the wings symbolize the liberty and freedom, the waiving arrow in her hands is pointing North, representing the flow of the St. John's River. Consuegra's main objective is to create a stopping point where everybody can have access and interact with the piece. 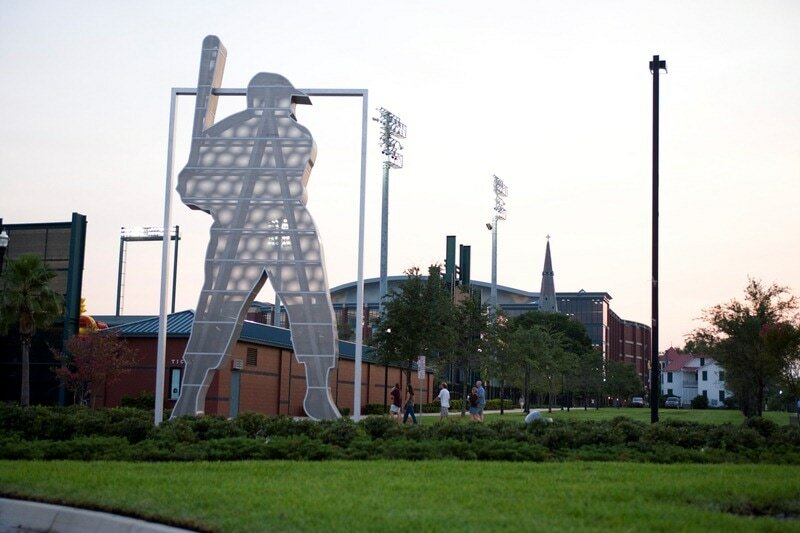 His purpose in creating the sculpture is to create a symbol for the City of Jacksonville. 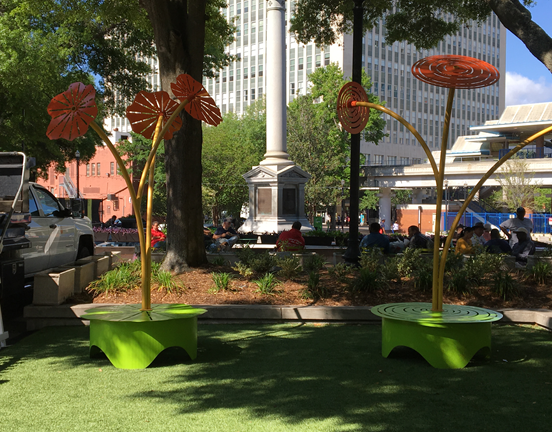 The sculptural seating is located in the kids play area of Hemming Park. This type of functional art gives flare and color to otherwise mundane spaces. The abstracted flower forms are meant to contrast the harshness of the surrounding concrete and brick. Sculptural bike racks balance form with function and comply with national bicycle parking standards ​to make bicycle parking more readily available along shared streets and at destinations. Lance's sculptural bike racks resemble the elements, earth, water, fire, and air. His sculpture concentrates on tension between interiority and exteriority, both metaphorically and physically. Lance's concept was to activate the urban landscape with line and form and interesting use of color. To become a cultural touchstone that forms a strong community bond through the arts. The DIA Urban Arts Projects of the Urban Art Facade and Streetscape Program, funded by the Downtown Investment Authority (DIA), are arts-based civic engagement public art commissions promoting community development through public art, urban design, and attractive streetscapes in Jacksonville's downtown core. 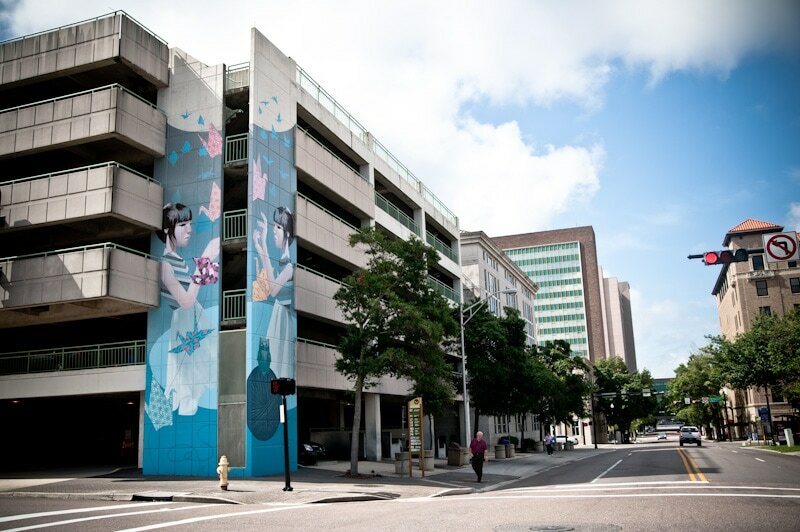 Art in Public Places (APP), the City of Jacksonville, the Downtown Investment Authority, and the Office of Public Parking have partnered together as part of Phase Two infrastructure enhancements at the city-owned Water Street parking garage. Finished artwork for this project will be incorporated into the building's exterior and physical site. The APPC is responsible for commissioning artists and artworks for APP. Their responsibilities include the selection, placement, installation, and maintenance of art on City-owned public property. 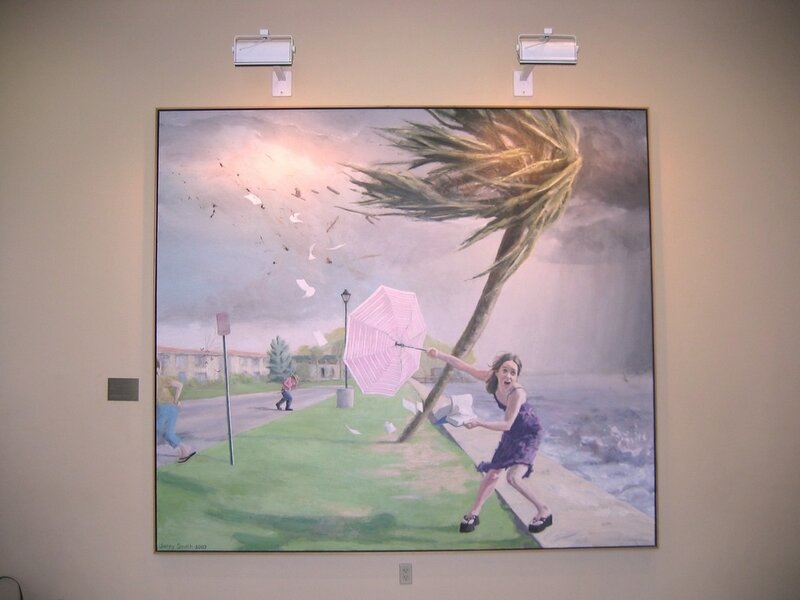 ​The APPC relies on Art Selection Panels to make recommendations regarding City-funded artwork. Every APP project is assigned a Art Selection Panel, which disbands at the completion of the project. As specified in the City of Jacksonville Ordinance Code, Chapter 126, Part 9, the Art in Public Places Committee (APPC) members are appointed by the Mayor and approved by the City Council. The APPC is responsible for receiving, reviewing, and acting on the recommendations of Art Selection Panels (ASP). The goal of the APPC is to choose art which is compatible with and which will enhance the architecture and general environment of the City. The APPC ensures that at least 15 percent of the artists selected for purchase or commission will be residents in the Greater Jacksonville area (the counties of Duval, St.Johns, Nassau, Clay and Baker). ​The 11-member APPC, as designated in the Ordinance, includes three representatives from the Cultural Council of Greater Jacksonville, three representatives from the professions of architecture, interior design, landscape design, planning, art professional, or art historian, and five representatives from the community at large, each residing within a different City Planning Distrit, whose interests, professions, and community activities reflect the diversity of the Jacksonville arts community. ​APPC members are appointed for a three-year term, and may be appointed one additional three-year term. Learn about local, regional, national, and sometimes international artists. Participate in the public art process. Gain experience in public meetings. Participate in the legacy of permanent artwork in Jacksonville. Contribute to local arts advocacy efforts. Serve as Art Selection Panel chairperson when requested. Serve on special sub-committees and task forces as may be requested for special projects or events, committing the necessary time and expertise. Attend APPC related functions such as city committee meetings, artist development seminars, conferences, community meetings and dedication ceremonies. Adhere to the highest standard of ethics and best business practices. Become familiar with the City of Jacksonville Ethics and the Florida Sunshine Laws and attend periodic training sessions offered by the City. Identify and help cultivate new APPC members. Promote and advocate for the APP Program, acting as goodwill ambassador to the community. Seek to ensure that at least 15% of the artists selected for purchase or commission will be resident(s) in the Greater Jacksonville Area (5-county) and will also encourage the selection of regional artists e.g. Florida and Southeastern US. The APPC meets on the 2nd Wednesday of every month. Meetings start at 12:00 PM and are public noticed. The public is encouraged to attend these meetings if they have an opinion about Art in Public Places. Meeting notices, agendas, and minutes are uploaded to the News section of the Cultural Council's website. Direct Purchase: Purchase of existing work and all rights thereto. Artists must be recognized by art professionals as artists of serious intent and recognized ability. At least 15% of the artists selected for purchase or commission must be residents in the Greater Jacksonville area. This includes the counties of Duval, St. Johns, Nassau, Clay, and Baker. As of November 2016, 45% of the City's official art collection was purchased from local artists. Exploring Art in Public Places is a K-12 Curriculum designed to integrate social studies, language arts, visual arts, and technology, with the intention of bringing Jacksonville’s Art in Public Places Program into the classroom. The curriculum is designed so that a teacher has everything they need to conduct a substantive, cross-curricular lesson in their classroom. The curriculum also uses vocabulary that teachers are already using with their students. In this way, Exploring Art in Public Places can serve as a supplement to the curriculum already utilized in DCPS classrooms. The program provides K-12 art teachers with the opportunity to introduce their students to works of art that are in their communities. By introducing new generations to public art in Jacksonville, we give these works of art a chance to tell their story to a broad audience and keep their stories alive in classrooms across Duval County. In this way, DCPS teachers can act as stewards of public art in Jacksonville and further help to educate and inspire citizens that appreciate the arts.